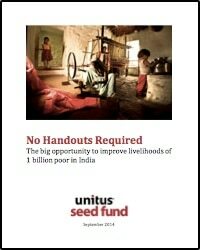 We are pleased to release our newest market report No Handouts Required: The big opportunity to improve the livelihoods of 1 billion poor in India. Since the founding of Unitus, one of the key questions we have strove to address has been: How can we improve the income, in one way or another, of those who are poor? When you can invest into a person’s ability to generate more income, instead of giving them a handout, there are all sorts of rippling implications. As the amount of money in a person’s pocket increases, so does the amount of choice in their lives. And it is choice that empowers the poor with the ability to select how they want to invest into a better future, be it on better education, healthcare, a business venture, or a home.